Some types of cancer cannot be treated with classical chemotherapy. 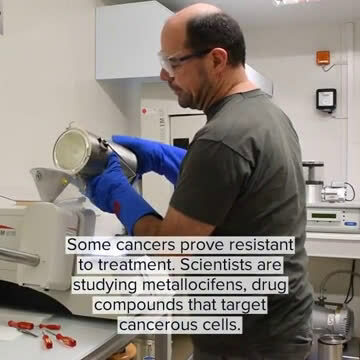 Scientists from Inserm, CNRS, Sorbonne University, PSL university, University Grenoble Alpes and ESRF, the European Synchrotron, are working on a metallorganic molecule as an antitumor drug. Their research has produced thorough insights into its mechanism in attacking cancer cells. This study is published in Angewandte Chemie. Triple-negative breast cancer, which represents 10 to 20 percent of breast cancers, is not fuelled by hormones. In fact, it tests negative for estrogen and progesterone receptors and excess HER2 protein. This means that it does not respond to hormonal therapy and antibody medicines. Given that it is more aggressive and often has a higher grade than other types of breast cancer, the scientific community is relentlessly trying to find a treatment. "We know this molecule works because extensive tests have been already carried out, but we don't know how it manages to kill the cancer cell. That is why we want to quantify and localise the drug inside the cell, to understand its efficiency," explains Sylvain Bohic, scientist at the Inserm and main author of the study. The scientists used the beamline ID16A at the ESRF for their investigations. State-of-the-art synchrotron imaging brought unique insight into the intracellular distribution of the metallocifen, which they could track down with a resolution of 35 nanometres. "The investigations are going on for a few years and finally benefit of the latest capabilities of the instrument in terms of 2-D and 3-D cryo X-ray fluorescence approaches," adds Peter Cloetens, in charge of ID16A. For the first time, they showed how the molecule penetrates the membrane of the cancerous cell in an extremely easy manner, due to its lipophilic nature and target an essential cellular organelle the endoplasmic reticulum a large organelle made of membranous sheets and tubules that begin near the nucleus and extend across the cell. Then, it oxidises and attacks different parts of the cell at the same time, leading to efficient anticancer activity. 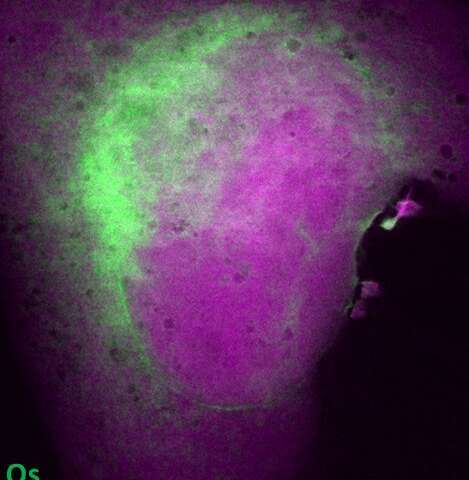 "Think of it as if the metallorganic molecule starts many fires in different places in the cancer cell, until the tumoral cell can't deal with it anymore and it dies," explains Bohic. "This study is a contribution to the understanding of alternative mechanisms from chemotherapy to heal cancer. We are at an early stage of research, so clinical trials have not begun yet, but so far it is promising," says Prof. G. Jaouen. The next step is to find out how this molecule acts in healthy cells and to study toxicology.